Do you remember back in 2015 when we debuted our TCFSwim event? Selling out in a day? A pool party? A swim fashion show? 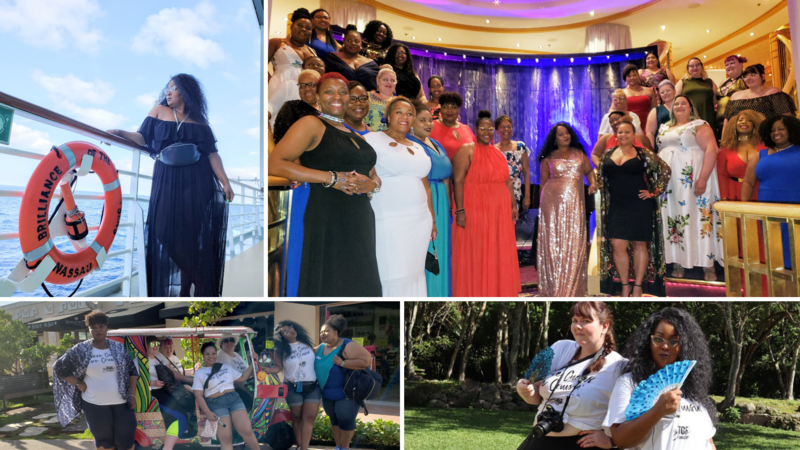 Well, we do and remember how much fun we had, the experience, the memories…So much so, that when we added the TCFCruise, we had so much fun that we had to bring it back! We heard you and we are taking our TCFSwim to the next level with our 2019 TCFCruise! You’ve asked and we listened! One of the biggest call outs, especially from years past, was to take a trip, going somewhere for a girl’s adventure, and guess what? We heard you and we are taking our TCFSwim to the next level with our 2019 TCFCruise! Yes girl, we are going on a cruise! And to make things even fancier, we’ve partnered with The Travel Divas to take care of us! It’s no surprise Carnival Magic debuted all-new ways to have a good time on board, and continues to prove it with the outdoor fitness-and-fun of SportSquare, featuring the world’s first ropes course at sea. This is also the ship that introduced the world to Cucina del Capitano, which serves up Italian favorites fit for a captain. Who can forget their first taste of RedFrog Pub, with its laid back, not-a-worry-to-be-found atmosphere… plus its exclusive, tasty, not-a-drop-to-be-found (on land, that is) beer, ThirstyFrog® Red. And if you wanted to visit the original Guy’s Pig & Anchor Bar-B-Que Smokehouse… guess which ship you’d check out! On a Carnival cruise, your stateroom is your home base. When the day is done, once you’ve had your fill of fun, you’ll head back to your stateroom and settle in for the night. No matter which kind of room you choose — whether you’re thinking of a simple Interior or Ocean View, or going grand with a Balcony— you’ll find yours a well-appointed way to wind down the day. And whether it’s day or night, all staterooms have a room steward on duty, an attendant you can call for complimentary room service, and more sweet perks inside. An Interior stateroom is the most affordable way to cruise, and Carnival Magic’s interiors are not just cozy, but are full of things you’d expect from any Carnival stateroom. Catch a glimpse of what’s going by from your Ocean View stateroom aboard Carnival Magic, where you’ll get views you won’t find anywhere on land. Don’t miss sunrise and sunset at sea — your comfy stateroom is the best way to experience these! Balcony staterooms were designed for maximum sea breeze and the most stunning views, so look to a balcony if you’re looking to cruise aboard Carnival Magic. Any time you’re in your room, you’re just steps away from your own personal outdoor oasis, featuring the sort of sea view you can also feel. We strongly suggest you find a flight to get you into Miami or Ft Lauderdale no later than 12 pm. You should arrive at the cruise port and ship no later than 3 pm. No exceptions! If you would like a Suite, please send an email to info@thetraveldivas.com and be prepared to make a $400 per person deposit (deposit fee can change).